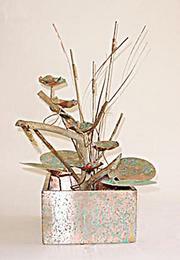 Copper fountains are uniquely designed and not factory produced. Each fountain is hand welded, not glued or siliconed together.. They are all make here in the USA. We can custom make most any size fountain you need! These fountains are hand made completely out of copper. Fountains come with an indoor/outdoor fountain pump and 3 way lighting system. 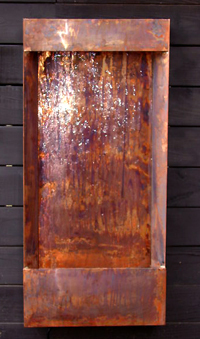 Beautifully designed all copper wall fountain. Fountain can be�easily installed�indoors or outdoors. 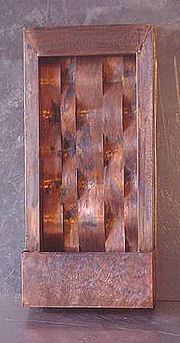 Water ripples down over the copper wall to create a very unusual sight n' sound. Fountains are very well constructed and each one has special attention to every detail giving you a one of a kind fountain. 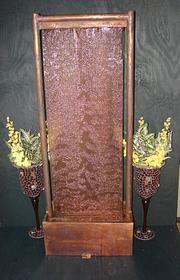 Fountains are not returnable as they are ALL custom designed and fabricated. 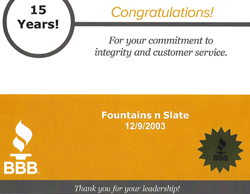 We will help you should there be any issue with your fountain. This would have to be brought to our attention within a 1 week time frame.